MINNEAPOLIS, Minn., Aug. 31, 2015 /Christian Newswire/ -- Forget the grilled cheese sandwich or the tree bark bearing the likeness of Jesus of Nazareth, a historical researcher claims to have discovered what appears to be a representation of the crucifixion "in the stars" on the day he is believed to have died. 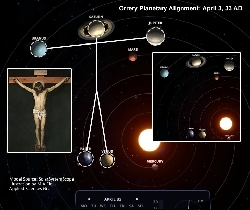 Moreover, and perhaps most noteworthy, is the date of the alignment, the day commonly viewed as that of Jesus' actual crucifixion, April 3, 33 A.D.
"More than a few studies have pinpointed that date based on the Bible, calendars, astronomical conditions, even geology," says Miguel Antonio Fiol, the researcher who made the discovery. It was while researching a manuscript that the UW-Madison history major came across the odd planetary formation using multiple heliocentric orrery models to study the date of Jesus' death via a top-down view of the solar system. "Even at first glance I knew it looked like the crucifixion," he adds. "But it took time to uncover all the incredible parallels." • The "crown of thorns" (or "halo") is represented by Saturn's rings. • The alignment began in mid-March and lasted through mid-April of 33 A.D.
• Alignment appeared previously in the year 4 B.C., regarded by some scholars as the year of Jesus' birth. • Fiol says the alignment appears to have occurred only six times between the year 0 and 2000 A.D., equivalent to once every 333 years. • Drawing a direct line from Jupiter through Mars to the centerline yields an accurate point for the "waistline." • Most notable finding perhaps is that the two "hands," Uranus and Jupiter, spin in opposite directions as do the two 'feet,' represented side-by-side by the planets Earth and Venus. "Those planets rotate as opposites or mirrors, like your left and right hand and your feet," says Fiol, who spent years researching historical figures, works and symbols such as π to find patterns and underlying meanings. "It was Da Vinci's The Last Supper that led me here," he quips cryptically and without irony. Fiol claims his findings are easily verifiable yet concedes there will be interpretation, realistic models and bias. "People will see what they want to see though I think coincidence is a hard argument," he concludes. "It's like spotting Jesus on a Reuben or any kind of sandwich, either you see it or you don't."